Surrey paint shop Altamura has put the finishing touches to this one-off Aprilia RSV-R to celebrate the tenth 10th anniversary of Aprilia’s sports v-twin. 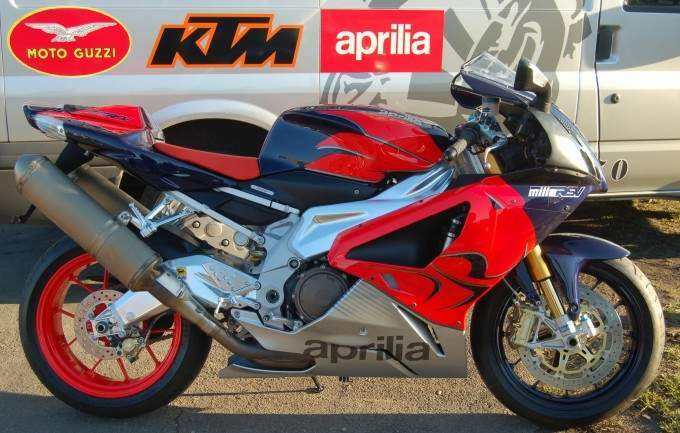 The standard 2008 model RSV-R has been carefully sprayed in the same purple/orange silver colour combination as the first RSV1000, but with the modern Aprilia ‘lions head’ style graphics. The look is achieved with paint only – all of the details and the logos on the bike are sprayed on over the base colours. The wheels are also matched to the panels – the front in purple, and the rear in red.